We deliver consistently beautiful fences that are built to last. We provide free onsite estimates with fair and honest rates. We are always professional and complete our jobs on time. We make sure that one of our owners is always available to supervise every project. We are passionate about fences. As a family-owned and -operated local fence business, we pride ourselves on offering superior service. We never use subcontractors. Instead, we have a staff that consists entirely of fence experts with an average of 15 years' experience fabricating, installing and repairing fences made of iron, chain link, wood, vinyl, aluminum and steel. We can help homeowners and business owners alike design and plan their new perimeter fence, as well as window bars, railings and more. J&J Fence is licensed, bonded and insured. Call today for more information. Our quotes are free and all new customers enjoy a 10% discount. Our primary business involves ironwork, from blacksmithing to welding. 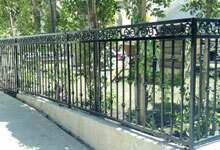 We can make just about anything from iron but focus on making fences, window bars and handrails out of ornamental iron, security iron and authentic wrought iron. Our work can be seen in homes throughout Los Angeles, including celebrity homes and commercial accounts. For our clients from Inglewood, we are usually sought out for our iron fences, gates, railings and window bars because we offer competitive pricing, a broad range of iron strengths and reliable construction. 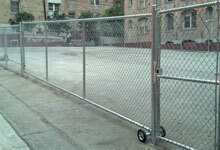 J&J Fence's chain link services are able to meet just about every residential and commercial fencing need in Inglewood. From creating secure storage areas and security perimeters to constructing low-maintenance, affordable fencing for homes, tennis courts, kennels and playgrounds, our chain link fences are an extremely versatile and practical fence option. For those clients who need a high security fence, we can use a large gauge chain link, attach strands of razor wire or barbed wire to the fence's top rail, and install access controls to the gate. Every item we offer is custom made to meet the needs of our customers and is constructed with the same quality workmanship, materials and attention to detail. Call today to learn more.